Stealing Beauty (Io ballo da sola) is a 1996 drama film directed by Bernardo Bertolucci and starring Liv Tyler, Joseph Fiennes, Jeremy Irons, Sinéad Cusack, and Rachel Weisz. Written by Bertolucci and Susan Minot, the film is about an American teenage girl who travels to a lush Tuscan villa near Siena to stay with family friends of her poet mother who recently committed suicide. The film was actress Liv Tyler's first leading film role. 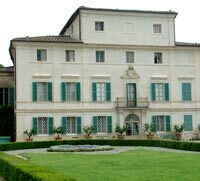 Villa Geggiano, which was one of the locations for the filmhas been chosen over the years for many TV and film productions. Other locations were found in the Chianti region, in the comune Gaiole in Chianti and Castelnuovo Berardenga. Lucy Harmon, a 19-year-old American teenager, arrives in the lush Tuscan countryside to be sculpted by a family friend who lives in a beautiful villa there. Lucy visited there four years earlier and exchanged a kiss with an Italian boy with whom she hopes to become re-acquainted. Lucy's mother, who lived in the villa, had committed suicide recently and Lucy wants to explore her mother's past. Lucy also hopes to discover the identity of her father, who her mother hinted was a resident of the villa. Once there, Lucy meets and befriends a variety of eccentric locals who were companions of her mother, and begins to form relationships and connections with each of them, especially with Alex Parrish, an English writer who is dying from terminal cancer. Lucy yearns to lose her virginity and becomes an object of intense interest to the men of the household, but the suitor she finally selects is not the initial object of her affection. After Alex is taken away to a local hospital - presumably going there to die - Lucy finally loses her virginity in the farm fields outside the villa. Villa Geggiano. The arches in the green theater are decorated with niches containing statues of Tragedy and Comedy. Source: the Wikipedia article Stealing Beauty published under the GNU Free Documentation License. Situated in the spectacular scenario of the Tuscan countryside and hills, Podere Santa Pia is the ideal property for a holiday accommodation and vacation in Tuscany. The house is an authentic holiday home in Castiglioncello Bandini, a small village in the Maremma, in the south of Tuscany, situated half way between Florence and Rome and close to Montalcino, Arcidosso and Monte Amiata. The original building was a small cloister, and today it is a perfect holiday home. The house offers four large bedrooms on the first floor with a total of eleven accommodations. A generous garden sweeps down the hill with olive and downy oak trees and various areas for relaxing and soaking in the views. The cool shadow of centuries-old oak trees, the thousand colors of the garden changing at each season make of this place a natural oasis. Siena was the background for Palio, a gripping documentary by female director and Tuscan native Cosima Spender, about the Palio in Siena. Podere Santa Pia is situated in the unspoiled valley of the Ombrone River, only 21 kilometres from Montalcino. This valley is famous locally as being of great natural beauty and still very undeveloped.